Suppose that you have a hyperlink or a button and clicking on that element causes an Ajax request to be sent to the server. The Ajax request returns some data that is loaded in some other element. Once the data is retrieved there is no need for the click event handler to fire. If you keep firing the click event handler you would be unnecessary making Ajax requests to the server. As you can see the above Web Form consists of a GridView control that lists EmployeeID, FirstName and LastName from the Employees table of Northwind database. The Get Notes column is a a HyperLinkField and doesn't have any server side functionality. Clicking on the Get Notes link executes some Ajax code that retrieves Notes for an employee. The Notes are appended to a Label control placed below the GridView. Once retrieved there is no need to retrieve Notes of the same employee again and hence the click event handler of the Get Notes link for that employee can be removed. Then add a Web Form to the project and place a GridView on it. Add two BoundField columns and one HyperLinkField column to the GridView and design it as shown in the beginning of this article. Also, place a Label control below the GridView. The GridView1_GetData() returns all the Employee records where Country is USA. Only the EmployeeID, FirstName and LastName columns are returns because our example needs only these columns. The GetNotes() web method is intended to be called from the client side script using Ajax. The GetNotes() method accepts an EmployeeID and returns the Notes for that employee. The above code uses one() method of jQuery to wire a one time event handler to all the hyperlink elements from the Web Form. In our case this will cause all Get Notes links to have the specified function as the one time click event handler. The first parameter of the one() method is the type of event that is to be handled (click in this case). The second parameter is the event handler function. The event handler function retrieves the EmployeeID from the first column of the row whose Get Notes link is clicked. Notice the use of closest(), children() methods and :first-child selector to accomplish this task. 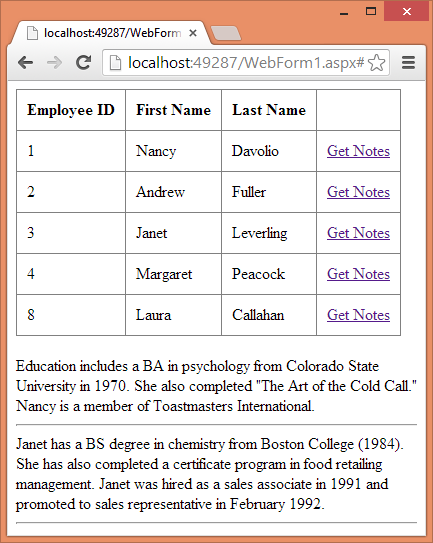 Then an Ajax call is made to the GetNotes() web method using jQuery .$ajax(). The EmployeeID retrieved earlier is passed as the data parameter. The success function receives the return value of the web method. In this case the success function will receive the Notes for that employee. The Notes are then appended in the Label (lblNotes) using append() method. To test the function of the Web Form, set a breakpoint at the GetNotes() web method and run the application. You will observe that when you click on the Get Notes link for an employee for the first time, the Ajax call is made and the Notes are retrieved from the database. This will be evident from the fact that your execution will halt at the breakpoint. Once Notes for an Employee are retrieved clicking on Get Notes doesn't cause the Ajax call and the web method won't be called again and again. That's what we wanted!